BrandJuice Consulting is a brand strategy firm with a client base including General Mills, Verizon, Clorox, Kaboom, and other heavy hitters. After purchasing a building on 17 Avenue they commissioned studiotrope to transform the interior into an environment conducive to their working methodologies and their image. During the early exploration stages several Power words were identified as concept drivers including ‘engaging, artful, distinctive, alive, fun, and fresh’. These terms coupled with the firms’ core values of fearlessness and authenticity provided a springboard for innovative thinking. 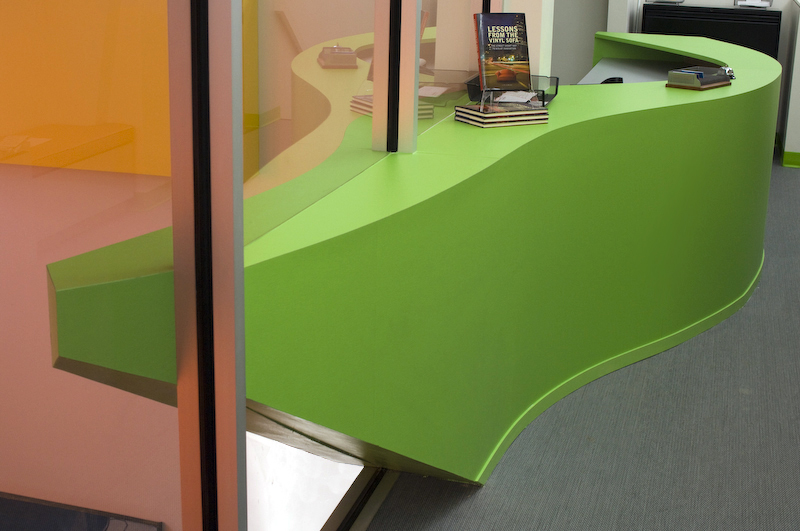 Grand gestures include the curved entry graphic wall and floating reception desk that penetrates through a glass wall and cantilevers into the Board Room.